The bodies were discovered in or near the decimated town of Paradise in the state’s north, bringing the number of confirmed dead from the blaze there to 23, according to officials. In the south of the state, near Malibu, another blaze that started on Friday claimed two more lives, bringing the total toll to 25, while thousands have fled and firefighters continued to battle all fronts. The wildfire near Malibu, know as Woolsey, has now doubled in size and covers an area of 28.000 hectares. More than 250.000 have been evacuated from Malibu and Calabasas, including many actors and celebrities that reside in the high-end area. 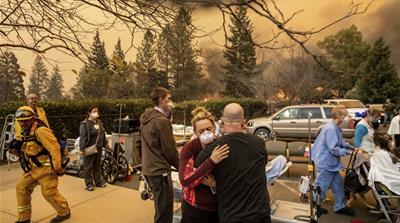 In Paradise, more than 6.700 homes and businesses have been destroyed, more structures than in any previous Californian wildfire on record and while Camp Fire is already the third deadliest in the state’s history, 110 people are still missing and the death toll expected to rise, according to officials. By Saturday, the Camp Fire had burned through 40.5000 hectares and was only 20 percent contained while fire chiefs estimated it would about three weeks to bring it fully under control. Firefighters hope to take advantage of a temporary drop of winds on Sunday to bring the fires more under control, while meteorologists expect southern winds to pick up on Monday and through next week, spreading the flames. Governor- elect Gavin Newson had issued a state of emergency in Butte County, Los Angeles and Ventura counties that continued on Saturday. Sheriff’s investigations have began searching through the wreckage of Paradise in California’s Butte County. Over 3,000 emergency personnel are fighting the blazes using 23 helicopters and firefighting air tankers according to officials but the raging winds and speed of the fires were staggering. The Camp Fire began spreading in the north through Butte County on Thursday with such force, firefighters were unable to stop it for the first 24 hours and had to focus solely on rescues while it flattened Paradise, according to statements. California Fire Butte County Unit Chief Darren Read choked from his emotions as he told firefighters, “it’s not an understatement to say that you got your butts kicked,” speaking about the initial fire run on Thursday. “We had very little time to evacuate our communities,” Read, who doubles as fire Paradise Chief, continued. “And you guys saved the lives of thousands of people in our communities. Truly heroic efforts,” he said. California Fire safety officer Jack Piccinini warned firefighters on Saturday to watch out for “emotional fatigue”. Firefighter Thor Shirley said it was the worst fire he had seen in 18 years as a Nevada City-based Fire firefighter. “It’s frustrating because you want to save property and lives. You just have to readjust what you do, conditions dictate the tactics — to save people’s lives is our No. 1 goal,” he said. His crew rescued people who were bed-ridden, three nurses, a doctor, a sheriff’s deputy and a California Highway Patrol officer. Firefighter Casey Peck said he “has never prayed so hard in his life”. Casey and Shirley who work for separate fire stations, were caught in the same traffic jam in their engines as cars ignited and trapped firefighters and fleeing residents alike. The fire was burning hot enough to peel the firetruck’s paint and melt its hoses, blowing relief valves designed to withstand 900 degrees and immolating nearby vehicles, Peck said. If it wasn’t for a Cal Fire bulldozer operator who “saved our bacon,” as Peck explained, they would probably all have burned right there. The bulldozer plowed flaming vehicles out of the road and cleared a lane for the fire engines and several vehicles to move to a grassy area, cleared down to fireproof mineral soil by the same bulldozer. Four people fleeing their flaming cars were pulled in the firetruck, including a nurse from a nearby hospital with her pant leg on fire, Peck said after finishing a 48-hour shift on Saturday. The firefighters pressed fire-resistant blankets against the truck’s windows to provide insulation against the searing heat, then waited out the firestorm. President Donald Trump said “gross mismanagement of forests” is to blame for the wildfires. Next : In Russian Village Swallowed by Sand, Life’s a Beach. Just Not in a Good Way.